Laminate flooring is fairly new to the market compared to the other types of flooring that have been around for decades. Most consumers are not familiar with this type of wood flooring. 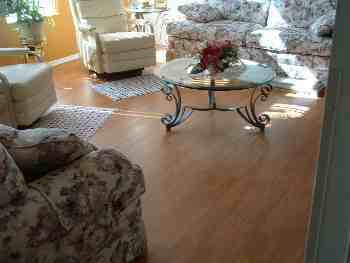 This is where it is easy to make big mistakes if your going to purchase this flooring for your home or business. There are hundreds of brands being manufactured these days, from 6mm to 15mm thick. There are all types of finishes from high gloss (Piano finish) to distressed (Rustic) and everything in between. Manufacturers hold patents on the locking systems, some are easy and some are hard to work with. This can be very confusing to come to a decision when shopping for laminate flooring. Hopefully I can help shed some light on these subjects that will help my readers find the best laminate to fit your needs. Here are some quick links below for different tasks that you may need to know about when installing your flooring. At first this type of flooring was just a flat surface that fit tight together at the edges and had to be glued together. I have seen the changes over the years as an installer. Now you can purchase laminate that resembles hardwood flooring to such a degree that you just can't tell the difference. This site can help you have beautiful new flooring in your home. This flooring can transform your home into what feels like a new home. I see this all the time in the work I do. Here you can find information such as Complete Step by Step Instructions for the DIYers who want to save the expense of someone else installing their flooring, and many other topics that may help you to decide what you need. If you are reading this, you have some interest in laminate flooring. Maybe you want to install your own floors or want someone else to install it for you. As an experienced installer I could tell you what I would recommend based on my own experience as an installer. I want my readers to know that when I write about different brands of flooring they are my unbiased opiniuns. The best way to make a good decision is to educate yourself, so you have a better understanding about this relatively new type of flooring. 1. Selecting the wrong flooring, quality can vary a lot between brands, the better quality isn't always more expensive. 2. Installing the floor improperly, knowing how and where to start, and how to end the floor. Installing transitions and quarter round, or baseboard. These are just a couple of things that you may have to address that should be done properly to have the best results. I have designed this site to educate my readers about installing these beautiful floors in your homes. You can learn how to install these floors here, or if you are in my service area you can contact me to install it for you. I have put together the information needed on do it yourself installation. It can be very helpful understanding the dos and don't s when laying your floor. I install this flooring for a living and I still cannot figure out how the manufacturers could put commercials on TV prompting people to install it themselves. It just isn't as easy as they make it sound all the time. ( you notice they don't do that now). Clicking two boards together is one thing, but understanding everything that can be involved in finishing the floor is quite another. Don't get me wrong, I'm not saying that everyone that lays their own floor will do it wrong. I have seen DIY floors that have been done really nice, and I have also seen some nightmare DIY jobs. I guess what I'm saying is it can be pretty tricky to lay this flooring. ( prep, cutting door jambs, spacing, molds, finish work). I feel for someone who wants to put their own floors down but just needs more information to continue and doesn't have much luck finding it. Some things people don't realize is there can be a big difference from one manufacturer to another. There are different qualities as well as locking systems and pricing. As an installer of these floors I have installed many brands from the very bad to trouble free products. I will offer my own opinions of the pros and cons between different brands that I have installed. Preparation: removing the old flooring, cutting the door jambs, removing baseboard. How to trim out your new floor after installing it. The base board, quarter round and transitions are like a picture frame, it frames in your floor and makes it look like a good piece of art. Knowing what to expect when having someone install your flooring.